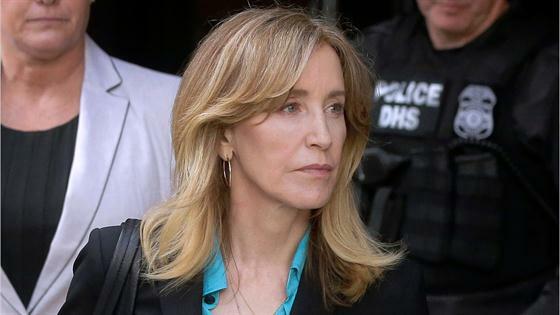 Felicity Huffman Pleads Guilty: "I Accept Full Responsibility"
Felicity Huffman is pleading guilty in the college admissions scandal. On Monday afternoon, the actress released an emotional apology for her actions and revealed she is pleading guilty to the one charge of conspiracy to commit mail fraud and honest services mail fraud that was brought against her on March 12. "I am pleading guilty to the charge brought against me by the United States Attorney's Office," the Desperate Housewives star announced. "I am in full acceptance of my guilt, and with deep regret and shame over what I have done, I accept full responsibility for my actions and will accept the consequences that stem from those actions." According to the plea agreement obtained by E! News, the U.S. Attorney will recommend a prison sentence at the "low end" of the sentencing range, in addition to a "fine or other financial penalty of $20,000." The U.S. attorney will also recommend 12 months of supervised release and restitution payments to be determined at a later date. As part of the agreement, Felicity has also forfeited any claim to assets seized for the purpose of the investigation. In accordance with the agreement, Felicity relinquishes any right to an appeal, "regardless of whether she later changes her mind or finds new information that would have led her not to agree to give up these rights in the first place." In addition to her announcement that she is taking full responsibility, the actress apologized to her daughter and other students who were negatively impacted by the college scandal. She remorsefully wrote, "I am ashamed of the pain I have caused my daughter, my family, my friends, my colleagues and the educational community. I want to apologize to them and, especially, I want to apologize to the students who work hard every day to get into college, and to their parents who make tremendous sacrifices to support their children and do so honestly." Furthermore, the star revealed that her teenage daughter was unaware of the lengths she went to ensure her admission. "My daughter knew absolutely nothing about my actions, and in my misguided and profoundly wrong way, I have betrayed her. This transgression toward her and the public I will carry for the rest of my life," Felicity stated. While the actress meant well, she acknowledged that it is "no excuse to break the law or engage in dishonesty." 12 other parents involved in the college bribery scandal are also planning on pleading guilty, including William "Rick" Singer. E! News has reached out to an attorney for Felicity Huffman for comment.